Khenpo Phuntshok Tashi, a very clear and articulate Master. 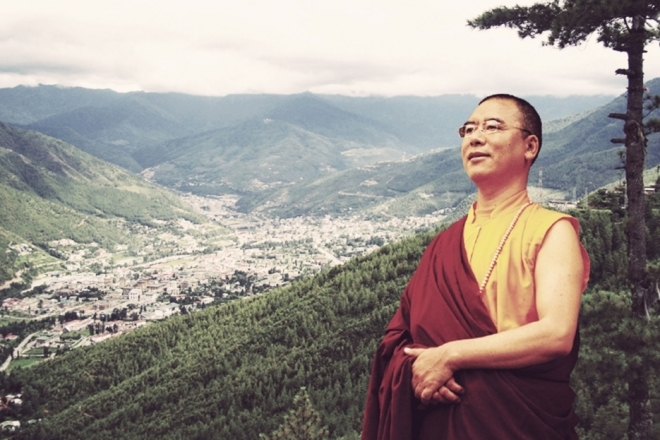 Khenpo has been teaching meditation and Buddhism for more than 17 years. He is the author of “Mindful Living in Bhutan”, and is the Director of the National Museum of Bhutan. His sense of humor and warm personality, which are in true Bhutanese style, join with his character to endear him to students and guest audiences. Khenpo is a champion of Bhutan’s policy of Gross National Happiness, finding it congruent with Buddha’s Dharma teachings. Khenpo speaks seven languages, and was Executive member of the 42nd Smithsonian Folklife Festival in Washington D.C., as well as curatorial team member for ‘The Dragon’s Gift: Sacred Arts of Bhutan Exhibition’, traveling throughout the U.s. and Europe. Khenpo Phuntshok Tashi has been a guest lecturer on Buddhism and Gross National Happiness in Japanese Universities, meditation retreats in Denmark, Europe, and east asia. His work on ‘The Origin of Happiness’, brings together his keen research interests in poetry, philosophy, physics, environmental philosophy, culture, and the Middle View. His work, ‘The Role of Buddhism in Achieving Gross National Happiness’, is a landmark, acclaimed work.